This is serious comfort food. I don't know where Grandma got this recipe. It is not the one on the Nabisco vanilla wafers box. This recipe calls for flour, rather than cornstarch, which makes for better texture, I think, and it doesn't make that large a pudding. Regardless of how well-loved a dessert this is, there's no denying that it doesn't hold over well past the second day -- not very attractively, anyway. If you do need a big pudding for a crowd, just double the recipe. You will make this often and, if you forget, someone will probably remind you. Peel the bananas and slice into 3/8-inch rounds; use a ruler (I'm kidding!). Cover the banana slices with plastic wrap to keep them from darkening, and quickly make your pudding. Combine the sugar, flour and salt in bowl, mix well, and set aside. In a heavy saucepan, beat egg yolks well (just use a fork or a whisk, but beat well). Over medium heat, add the flour mixture to the egg yolks, alternately, with the milk and vanilla, stirring constantly. Bring to a gentle boil and, when mixture begins to thicken, add butter, continuing to stir to prevent scorching. When the mixture reaches pudding consistency, remove from heat. Place a layer of banana slices in the baking dish on top of the vanilla wafers. Pour, spreading as necessary, half of the pudding over the wafers and banana slices. Put down another layer of vanilla wafers and another layer of bananas, and cover with the remaining pudding. For the meringue, beat the egg whites with an electric mixer until they form soft peaks. Add sugar, a tablespoon at a time, and cream of tartar, and beat until stiff peaks are formed. Fold the vanilla into the meringue, and spread the meringue over the pudding. Place in a preheated 375°F oven and bake until browned, 12 to 15 minutes, depending upon your oven. 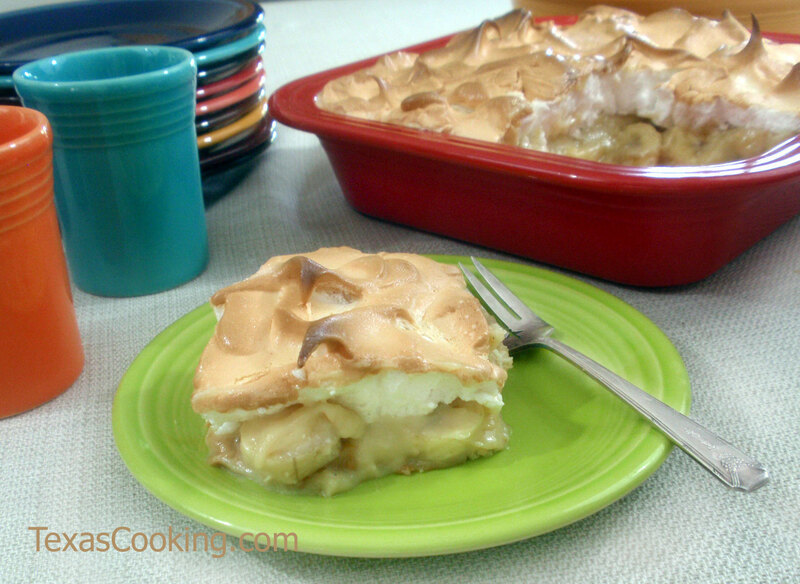 This recipe was featured in a complete step-by-step article on making the best banana pudding from scratch.